High Society Dinners offers extraordinary insight into the domestic arrangements of the Russian aristocracy, presenting nine months’ worth of menus served in Saint Petersburg to the guests of Pyotr Durnovo, Adjutant-General of the Tsar’s Imperial Suite. 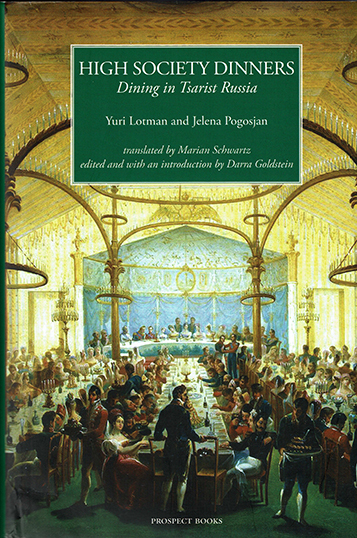 Durnovo’s menus and guest lists, interspersed with extracts from family letters and the leading newspapers and journals of the day, set in context the domestic and gastronomic underpinnings of life in this group at the heart of the Russian empire. “What makes this book even better than the original Russian is the scholarly commentary. Goldstein has spent much of her professional life unearthing Russian culinary history. As a result, she expands, and sometimes corrects, the [authors’] assertions to reflect Russian culinary history as it is now understood, based on her own prodigious research as well as the work of other culinary historians. Many of her commentaries are fascinating small essays that help open up the text to a greater appreciation of Russian food culture.